February 12, 2015 16:09 ET | Source: Sunwing Vacations Inc.
TORONTO, ON--(Marketwired - February 12, 2015) - On February 17, 2015, Sunwing will commence a new flight service from Charlottetown to Holguin, Cuba providing residents with an easy and convenient way to escape the winter chill and explore one of Cuba's most captivating tourist destinations. On the way, passengers can start their vacation off in style with a complimentary glass of champagne and relax with Sunwing Airlines' award-winning Champagne Service which includes food and wine and in-flight entertainment at no additional charge. Lapped by the waters of the Atlantic Ocean, the pristine white sand beaches that encircle the town of Holguin are perfect for sunbathing, snorkelling or enjoying a range of water sports. Passengers on the inaugural Charlottetown to Holguin service will also be amongst the first guests to experience the recently opened all inclusive Memories Holguin Beach Resort, which is set on an attractive beachfront oasis accented by towering palm trees and lush gardens. Expansive and inviting pools stretch throughout the property. Accommodations range from double rooms with terraces to spacious suites with separate living areas. For families, supervised activities at the Kids Club and Teens Lounge help keep everyone busy, and mealtimes are easy with seven buffet and à la carte options to choose from. In the evenings, guests are treated to live entertainment, and can mingle at one of six bars, including a Cuban cigar bar. Chief Operating Officer for the Sunwing Travel Group, Andrew Dawson, commented, "As Canada's largest tour operator to Cuba, we are excited to expand our services with this new direct route from Charlottetown to Holguin. Holguin is a perennially popular destination amongst our clientele and boasts a wide range of leisure attractions and accommodation choices to suit all tastes. New for this season, we are delighted to offer the Memories Holguin Beach Resort that has plenty to keep both families and couples entertained." Doug Newson, CEO of the Charlottetown Airport Authority added, "We are thrilled to have Sunwing Vacations back for another winter season with a new direct service to Holguin, Cuba. We can't thank Sunwing enough for providing islanders with a very convenient way to enjoy their winter vacation with this new program." 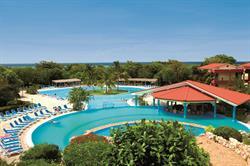 A week's stay at the Memories Holguin Beach Resort starts from $655 plus $325 tax per person and is based on two people sharing a Deluxe Room on an all inclusive basis departing Charlottetown on April 28, 2015. For more information on vacations to Holguin departing from Charlottetown visit www.sunwing.ca or speak to your local travel agent. All Sunwing Vacations packages include award winning Sunwing Airlines' Champagne Service, which features a complimentary glass of champagne, hot towel service, Hot & Fresh Bistro Meals™ served with a choice of wine at lunch and dinner, and complimentary in-flight entertainment, including first run movies and a generous 20 kg free baggage allowance. For just $50 more per flight segment, travellers can upgrade to Sunwing's Elite Plus service, which features advance seat selection, free headset, separate check-in at a majority of airports, advance boarding, 30 kg baggage allowance, priority baggage handling, and extra legroom seats. The Charlottetown Airport Authority operates the Charlottetown Airport, Prince Edward Island's only commercial airport, with a mission to operate a safe, efficient, competitive and financially viable, high quality airport that facilitates the air transportation needs of Prince Edward Island, the travelling public and our aviation clients. Direct service is provided to Halifax, Montreal, Ottawa, Toronto, and Holguin, Cuba through our air carrier partners Air Canada, WestJet, and Sunwing Vacations.